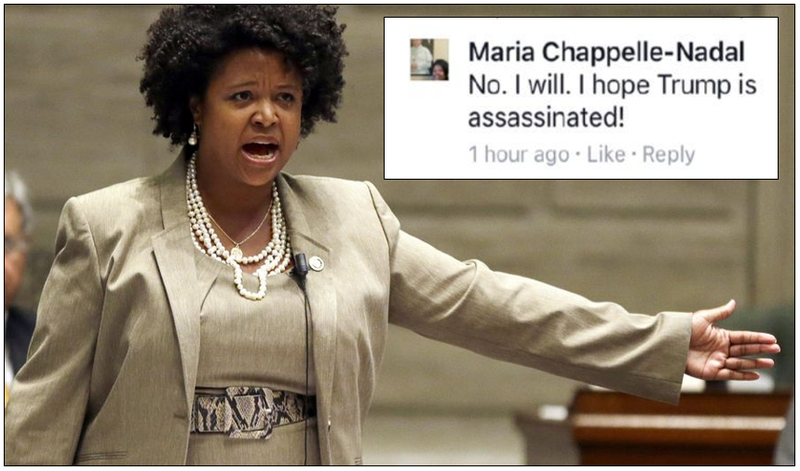 Maria Nicole Chappelle-Nadal (Democrat) hopes Trump will be assassinated and wants to see a positive change in reparations for slavery. Just so we’re clear: Democrat Values = Violence and Redistribution of Wealth. What makes reparations for slavery a phantom demand, you ask? First, no U.S. politician seriously believes a Slave Reparations Act could possibly be passed into legislation. Second, no one calling for slave reparations will provide a specific dollar amount. Instead they will speak in vague terms like, “…enough to erase the financial disparity…” This is deliberate because settling on a dollar amount means satisfying the demand is measurable and achievable. Satisfying the demand is not the desired outcome. A race baiter’s worst nightmare is to have their demand for the dollar amount met. If that was to happen, “We were slaves to the white devil” would be subject to the counter argument, “By your own standards, reparations were made in full.” Race baiters cannot have that. Third, no one calling for slave reparations will propose a way to implement a Slave Reparations Act justly. The legislation cannot justly take money from all white people. Our civilization does not operate on a principle of inherited culpability. Suppose your father was a mass murderer and he was sentenced to 150 years. Then he died after serving only 30 years of his sentence, do we put you in jail to serve the rest of his sentence? Of course not! That would be unjust. Furthermore, it would unjust to seize the wealth of those who had no part in slavery. A low estimate of the percentage of slave holders was 1.4%. A high estimate of the number of families that owned slaves was 32%. Regardless of who’s data you like, 100% of whites did not own slaves, 100% did not participate in the slave trade, and 100% did not benefit from the institution of slavery. How do we determine who is descended from people who owned slaves and who didn’t? What about people whose ancestors come from slave beneficiaries and those who didn’t? If white person A is 1/8 slave beneficiary, does he forfeit 1/8 as much wealth? It gets more complicated, what about the white people who came here after slavery was abolished? What about their descendants? By the way, it was white people that pioneered the abolition of slavery; black people and other people of color still practice slavery today. Wait, there’s another complication. What if a white person does not have enough wealth to pay his share of slave reparations? What about the people of color who owned slaves? It would be unjust to seize wealth from the descendant of white people for the offense of slavery without doing the same to descendants of people of color who committed the same offense. The legislation cannot justly divide it among all black people. It would be unjust to seize wealth meant for the descendants of slaves and give it to the descendants of slave owners. “One of the most vexing questions in African-American history is whether free African Americans themselves owned slaves. The short answer to this question, as you might suspect, is yes, of course; some free black people in this country bought and sold other black people, and did so at least since 1654, continuing to do so right through the Civil War.” I would also be unjust to seize wealth meant for the descendants of slaves and give it to people who arrived after the abolition of slavery. Wave a magic wand and pretend a Slave Reparations Act passed. How would it be implemented? Do you think government is going to pay those reparations? Or do you think the burden will fall on the taxpayers? If you are going to pay reparations, picture your tax bill. Now picture your tax bill plus reparations. Oh, can’t pay it? Do we seize your house? Empty your bank accounts? Liquidate your 401k? Maybe you can finance it… at what percentage? Who finances it? At what interest? Is the rate fixed or adjustable? Is the debt adjusted with inflation? Will the Slave Reparations Agency be part of the IRS or will it be yet another armed federal agency? Oh, hey, what if the descendants of the North American aboriginal peoples want to get in on the act too? How about foreign nations that feel they were wronged? No politician wants to write that legislation. No politician wants to pass that legislation (though they might be happy to vote for it). There is no just way to implement that legislation. There is no practical way to implement that legislation.